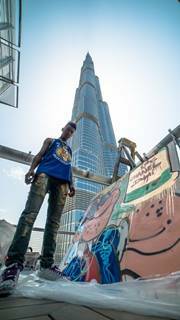 Prodigy teen pop artist Skyler Grey took his art to new heights in Dubai this week, creating a custom piece of art at the top of the world’s tallest building, Burj Khalifa. The 16-year-old Los Angeles-based pop street artist chose the 828 metre high superstructure for his backdrop as part of a collaboration with Dubai’s Department of Tourism and Commerce Marketing (Dubai Tourism) to raise awareness of the city as a leading art destination. Over recent years, Dubai has become the regional art hub and the backdrop of a contemporary visual arts scene, and Grey is yet another example of the forward-thinking, progressive style of art that has emerged in Dubai. Inspired by his surroundings – architecture and fashion – Grey’s painting pays homage to Chanel and Karl Lagerfeld, using a blend of acrylics and spray paint on canvas to bring his piece to life in his own unique style that he calls “Pop Street”. “Dubai is such a fashionable city and it’s clear that the people here take fashion seriously, so I thought this would embody the vision of the city,” says Grey. Skyler’s talent and creativity were recognized at an early age during a placement at art therapy classes following the tragic loss of his mother when he was two years old. 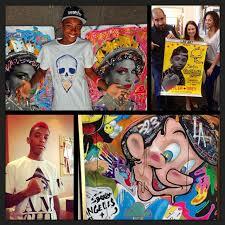 He holds the title of the youngest artist to be internationally exhibited and, although not formally trained, he has been influenced by the likes of Jean-Michel Basquiat and Keith Haring in developing his own distinctive artistic concept. Skyler is a rising star and one of the newest fixtures on the international street art scene – now showcasing his work in Dubai as part of Dubai Art Season, which kicked off in March and is a platform for Dubai’s artistic talent in synchrony with the UAE’s 2016 ‘Year of Reading’. Contemporary, visual and emerging are words best used to describe Dubai’s burgeoning art scene, and over the last month, the city has been enveloped in artistic and cultural activities celebrating the talent and creativity of various artists that recognize Dubai’s growing importance in the global art scene. The events continued this past weekend with World Art Dubai and COYA Collective, where Skyler unveiled his latest collection. 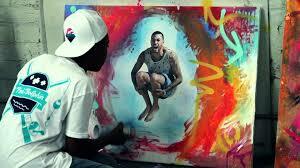 This was so well received that the paintings sold out on the first night of the showing. The recent launch announcement of Dubai Walls further cements the city’s commitment to growing the street art scene with the creative works of 15 of the world’s top street artists, including ROA and Blek Le Rat, transforming Dubai into a unique art hub. The initiative aims to transform public spaces into permanent street art exhibitions that perfectly align with Dubai’s modern landscape, providing a platform for global admirers of street art, offering an opportunity for visitors and residents to enjoy the beautiful artistic creations, and attracting visual art lovers from across the globe. Dubai Walls is currently live at City Walk, and Skyler’s works will continue to be showcased at COYA Collective until the middle of May 2016. ← What Was it about Prince?